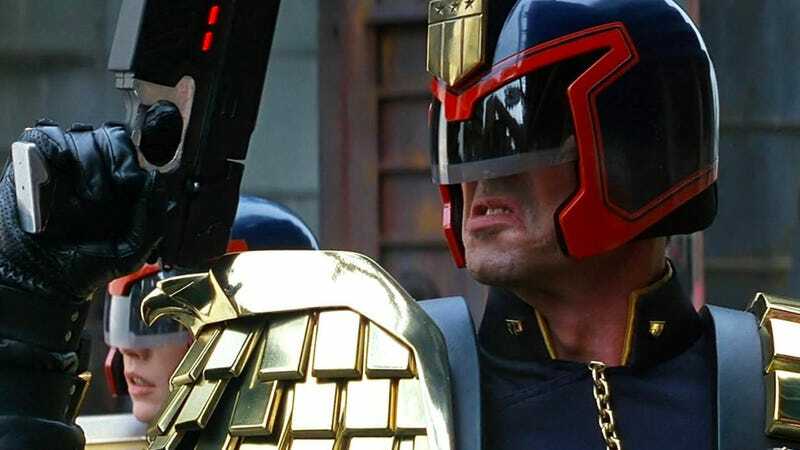 The odds of Judge Dredd returning to the big screen are pretty slim, but the popular character will indeed be back, just in a different medium. Entertainment Weekly reports that the character will be the star of a new live-action, ensemble drama called Judge Dredd: Mega City One. The show is in “early development” and “talent will be announced at a later date.” What we do know is that that IM Global and games studio Rebellion are teaming up for it, and the people at those companies helped develop Battlestar Galactica, Helix, and the 2012 Karl Urban-starring Dredd film. Much like the comics where Dredd made his debut, the show is set in a futuristic megalopolis that’s overridden with crime. Dredd will be one of several “Judges” at the center of the show—police officers who act as judge, jury, and executioner, who are tasked with controlling crime in the city. So basically it’s a futuristic cop show starring Judge Dredd. With a show this early in development, it doesn’t have a network or streaming service attached yet. But with so many out there these days, it would be pretty crazy if this didn’t get picked up. Here’s an early teaser poster for the show.